country. Detailed information is available on the CTET's official website http://www.ctet.nic.in. The last date for submission of online application is 05-03-2019. CTET is conducted by CBSE for recruiting the teachers in CBSE schools all over India. State governments also considered CTET for recruiting the teachers in stage government schools.CTET July 2019 will be conducted on 07-07-2019. CTET 2019 Exam score is valid for 7 years. CTET is applicable for the KVS, Central Tibetan Schools, NVS etc. CBSE all schools are considered CTET. Aided schools are also considering the CTET Score for recruiting the teachers. State Government running schools also considering CTET score if no TET. CTET July 2019 is conducted for recruiting the Class I to V teachers which is known as Primary Stage and Class VI to VIII which is known as Elementary Stage. For Class I to V teachers Intermediate or 10+2 with 2 years B.El.Ed Diploma or 4 Years B.El.Ed or D.Ed qualification is required and for Class VI to Class VIII Teachers Degree with B.Ed or 2 years B.El.Ed or 10+2 with 4 years B.El.Ed or 10+2 with B.A B.Ed/B.Sc B.Ed/BA.Ed/BSc.Ed. Paper 1 Exam duration is 150 Minutes. Total 150 MCQ will be given and each question carries one for this CTET Paper 1. Paper 2 Exam will be conducted for 150 marks. Total 150 questions will be given and each question carries one mark. Candidates must have scored 60% to get qualify for this CTET July 2019. That means that the candidates will need to get a minimum of 60 percent to get the pass. SC / ST / OBC / Handicapped candidates minimum qualification is 55%. 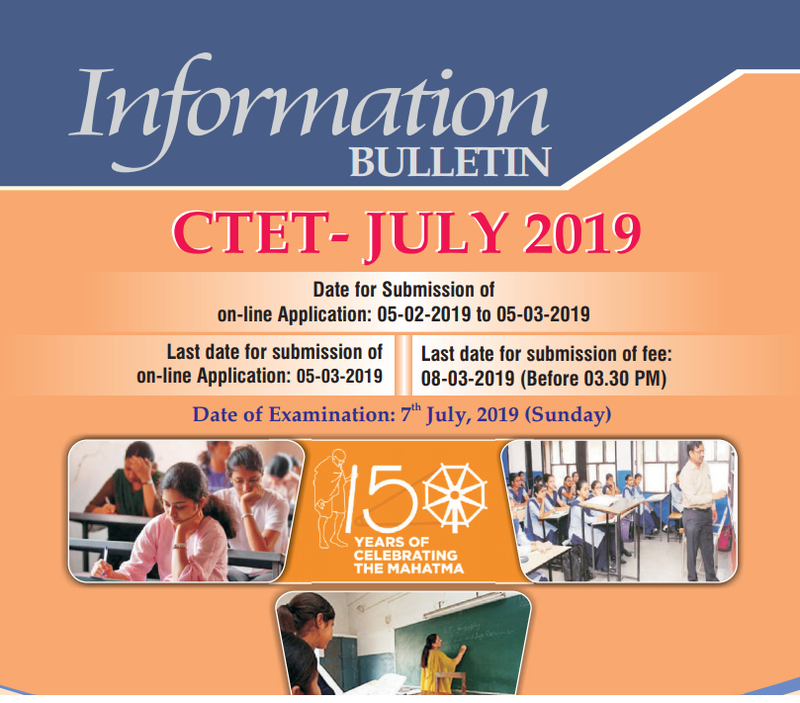 Online mode of applications only accepted for this CTET July 2019. 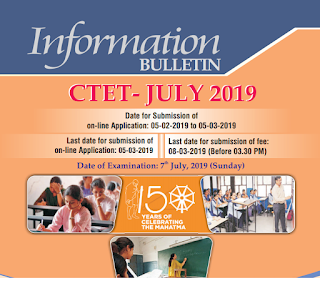 Last date to apply online for this CTET notification is 05-03-2019. Official website to apply online is www.ctet.nic.in. Admit card release date, exam key details will be updated in this website only. Admit card or Hall ticket for CTET Exam will be available 7 days before the exam date. Candidate who want the duplicate marks state or certificate they have take a demand draft in favor of "Secretary Central Board of Education" drawn any Nationalized bank payable at Delhi. Application format for applying for duplicate certificate or marks statement is available official website of CTET at www.ctet.nic.in. Candidate will get the CTET duplicate certificate or marks statement within the 14 working days. Rs.200 + Rs.35 postal charge.